A sermon preached by Rev. David M. Crawford at Rundle Memorial United Church, Banff, on September 11, 2012. (First of a sermon series on Rundleʼs stained glass windows) Based on Matthew 4:18-22; 28:16-20. Thereʼs only one place to begin this sermon series on our stained glass windows with the Wesleys, John, his brother Charles, and their mother Susanna? Take a look. Aside from the glorious colours that leap out at us, the craftsmanship, we see John Wesley at the center, riding a horse, declaring “the world is my parish”! 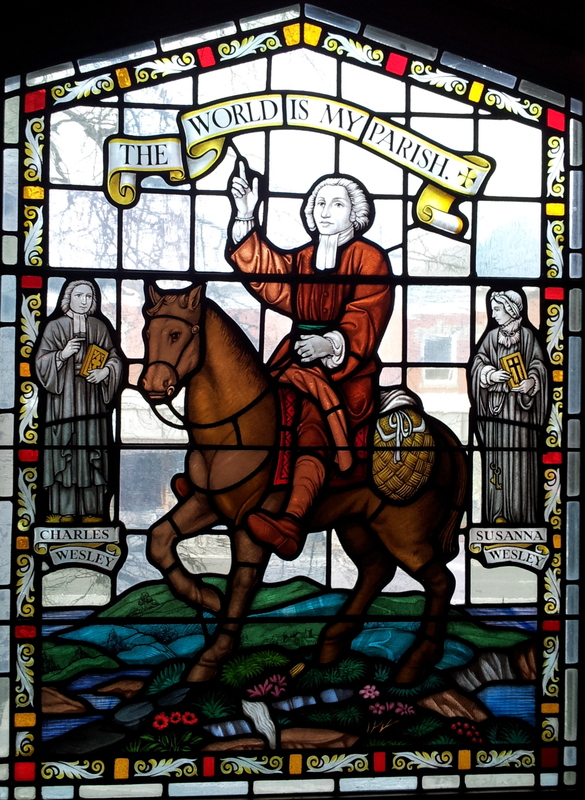 Taken in context, this seemingly serene picture of John Wesley betrays the courage, vision, and passion of the man, his passion for God, for Jesus Christ. John lived from 1703-1791, was ordained as an Anglican clergyman, which he remained all his life. Yet fairly early on in his spiritual development he felt led to move beyond the walls of the church, literally, to proclaim the message of Godʼs grace and love in Jesus Christ away from church structures and strictures. Inﬂuenced by another prominent Anglican rebel, George Whitﬁeld, he began preaching outside the boundaries of the church and against the wishes of his church as an institution. He became an itinerant or traveling preacher, leading worship services in open ﬁelds, homes, pubs, wherever, in order to reach those who wouldnʼt dream of darkening the doorway of a church. He did it mostly on horseback. He was ridiculed, attacked from the pulpits inside churches, ostracized by his clergy colleagues, not only for contravening church tradition but also for appointing his own lay itinerant preachers to travel where he couldnʼt, cover territory he was unable to cover. “Suffer me, now, to tell you my principles in this matter. I look upon all the world as my parish; thus far, I mean that, in whatever part of it I am, I judge it meet, right, and my bounden duty, to declare unto all that are willing to hear the glad tidings of salvation. This is the work which I know God has called me to; and sure I am that His blessing attends it. Great encouragement have I, therefore, to be faithful in fulﬁlling the work He hath given me to do. His servant I am and, as such, am employed according to the plain direction of His Word, “as I have opportunity, doing good to all men.” And His providence clearly concurs with His Word, which has disengaged me from all things else, that I might singly attend on this very thing, “and we go about doing good.” A couple of other facts: under his leadership, Methodists became leaders in many social issues of the time, such as prison reform and abolitionist efforts. He was one of the ﬁrst to preach against slavery, and was a friend of John Newton and William Wilberforce. Finally, Suzanna Wesley, mother of the brothers, has aprominent spot in that same window.. In all she had 19 children, though 9 died as infants. She had a hard life. Her husband left for a year once after an argument, leaving her on her own. After becoming disgruntled with the local clergy, she began doing her own church services with her kids at home. Theyʼd sing a psalm, sheʼd read a sermon, then another psalm. Soon the local people asked to attend. Eventually 200 people went to her Sunday afternoon services. Suzanna also wrote scripture commentaries, as well as commentaries on the creeds and the Lordʼs Prayer. The world is my parish. I wonder if, in a sense, those words arenʼt another way of saying, “Go, therefore, and make disciples of all nations”, or “Follow me and I will make you ﬁsh for people.” Wesley had a deep, evangelical conviction that the message of the faith, the gospel, Godʼs love, was meant for all, not just those who attended Sunday worship. So he took out it to the streets and highways, away from the trappings, some might say the intimidation, of church structures, to where regular people lived regular lives, the country ﬁelds and meadows, the town squares and markets. Is there a message for Rundle United in Wesleyʼs legacy? Is our calling to remain the same as weʼve always been, gathering here for worship in our small numbers, hoping that since our predecessors have built this church, because itʼs in a prominent place in Banff Avenue, others will just naturally come and join us? Or is there some way in which we are meant to take it to the streets, the message – I mean that God is real, is Love, and is available to anyone? How might we move beyond our walls to share this good news, to take a stand for justice in our world, to show compassion, to love in the spirit of Christ? Perhaps not “the world is our parish” but maybe “the Bow Valley is our parish”? “Today, there are more Methodist churches than U.S. Post Ofﬁces. And yet, the majority of those church buildings, that once were where the people were, are now where the people arenʼt. “The population has moved elsewhere, yet the church buildings have not moved. “Much of the energies of the denomination are expended in maintaining buildings where people once were, rather than going where the people are. “Throughout the Gospels we witness a Jesus who is on the move, going from one place to another, speaking of the kingdom of God wherever he ﬁnds himself. “Perhaps Jesus is still on the move in our own time, yet those who refuse to move with him are left behind? Friends, is the world, is the Bow Valley, our parish? To what degree are we willing to take Godʼs love out there, the parish beyond, the parish that awaits?